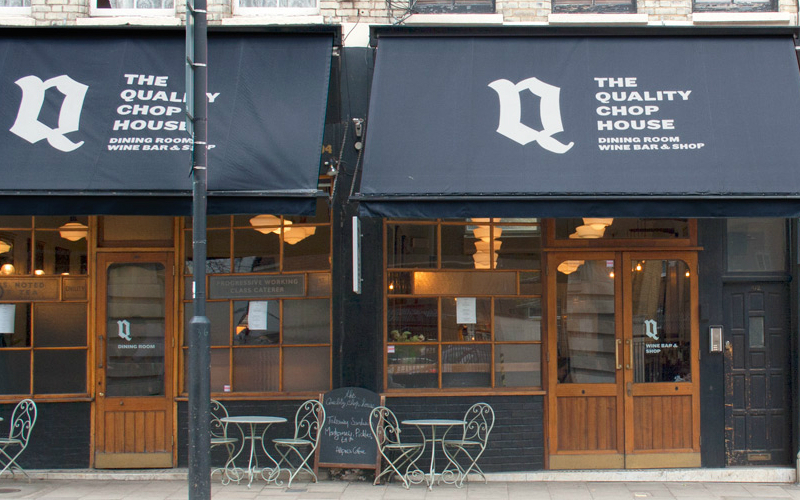 London’s wine bar scene has come on leaps and bounds in the last few years. 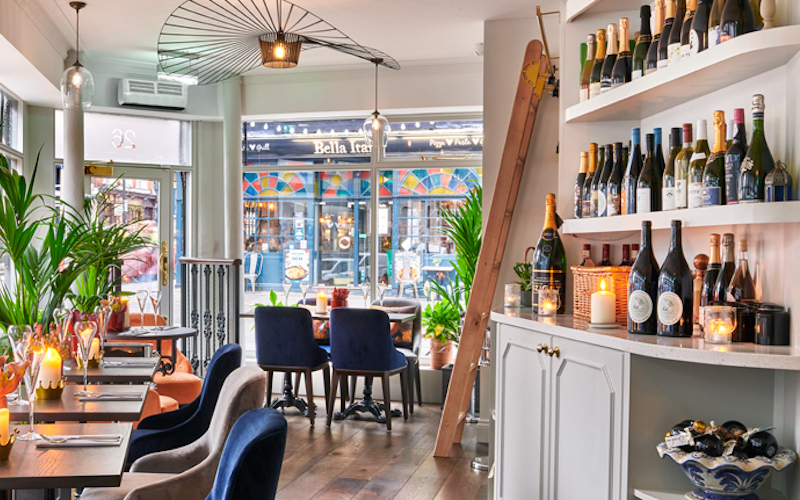 Far from stuffy old places, London has embraced the Parisian style of clean modern wine bars with unpretentious staff championing independent winemakers. Many specialise in natural or biodynamic wines, and all now offer a great selection of food too. One of our favourites, Weino BIB in Dalson even focuses on boxed wines which are more sustainable as they use less glass and packaging. So if you’re wondering where the best wine bars in London are, well you’ve come to the right place. The Drop is a cute little wine bar with organic and low intervention wines and a pretty banging menu of snacks and heartier dishes. The space is very cute and perfect for a wine bar with exposed brick walls and low arched ceilings due to the building’s heritage as a coal store. Weino BIB started life as a pop-up serving wines from bags in a box making them not only better for the environment but also cost effective too, which essentially means you get cheaper glasses of great vino. The wines are mostly natural and you can also bring your own bottle which you can fill up from the boxes and kegs to take-home. During the day St Paul a great place to sit and have a coffee or lunch from the menu of sandwiches, eggs, toasties, and pastries but at night it turns into a proper wine bar. 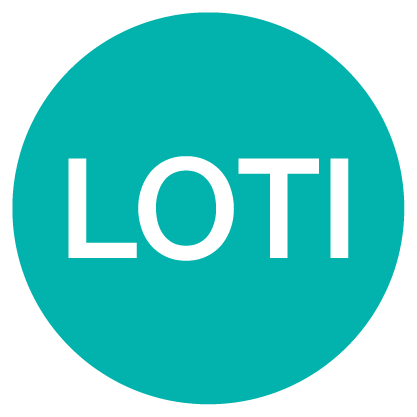 The owners are very friendly and welcoming and talk you through the wines and food with great enthusiasm – this is something they are clearly very passionate about. St Paul is a place to spend a few hours trying different wines and grazing on small plates of charcuterie and cheese. Any new project from Michael Sager is bound to be a success and with his latest opening, Fare Bar + Canteen, he’s got another hit on his hands. Offering more than your straight up wine bar, there’s also a takeaway coffee area, strong cocktail list and seperate restaurant as well as the 250-strong Sager + Wilde curated wine list sourced directly from boutique winemakers across the world. In the kitchen is Thomas Raymond, who used to work at Ellory, cooking a menu of small plates, grilled skewers and larger sharing dishes. We loved the ​Cylindra Beetroot; Fried Globe Artichoke; and Fare’s Wet Burger – Red devon beef patty, sweet paprika and sour cucumber. 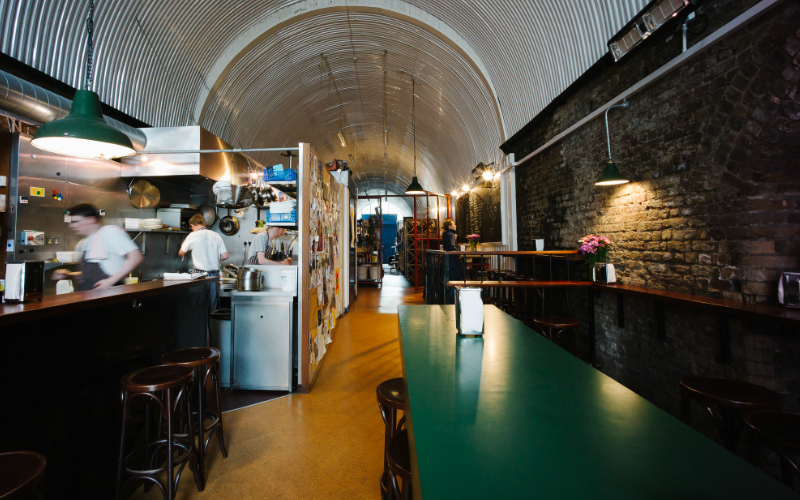 All in all, Fare Bar + Canteen is a great addition to London’s wine bar scene. The Drop is a cute little wine bar with organic and low intervention wines and a pretty banging menu of snacks and heartier dishes. The space is very cute and perfect for a wine bar with exposed brick walls and low arched ceilings due to the building’s heritage as a coal store. On the food front you should definitely start with the marinated black Angus, thin slices of raw beef that really do melt in the mouth. The Hedone bread with salted butter is pretty hard to say no to as well. 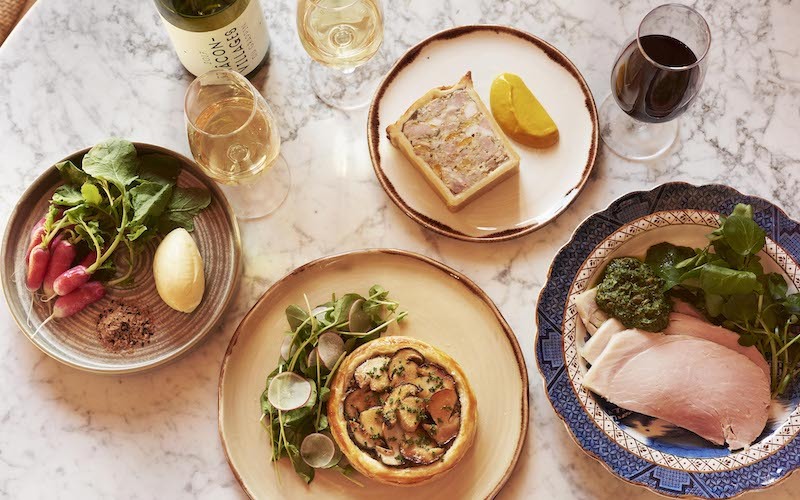 From the small plates, our faves are roasted squash with onions and sage and the chicken liver pate and beetroot salad, and the guinea fowl and girolle mushroom pie also hits the spot. 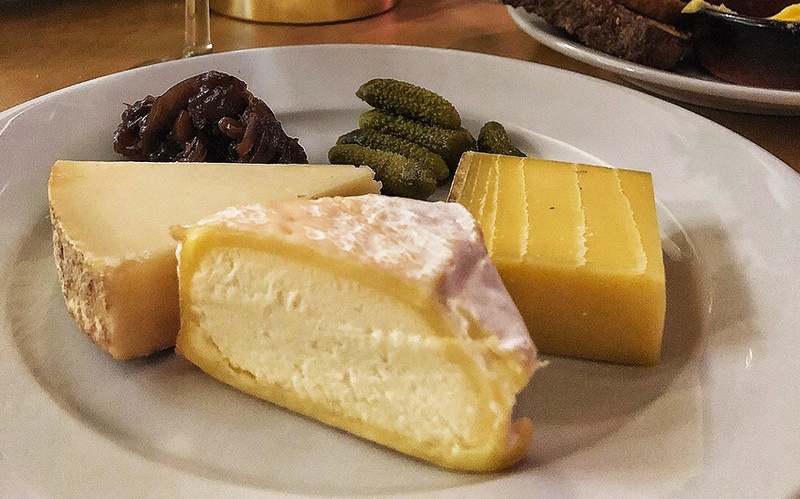 Instead of dessert, get a plate of cheeses and a glass of red wine to finish – this is is a bleedin’ wine bar after all. Weino BIB started life as a pop-up serving wines from bags in a box, making them not only better for the environment but also cost effective too, which essentially means you get cheaper glasses of great vino. The wines are mostly natural and you can also bring your own bottle, which you can fill up from the boxes and kegs to take-home. 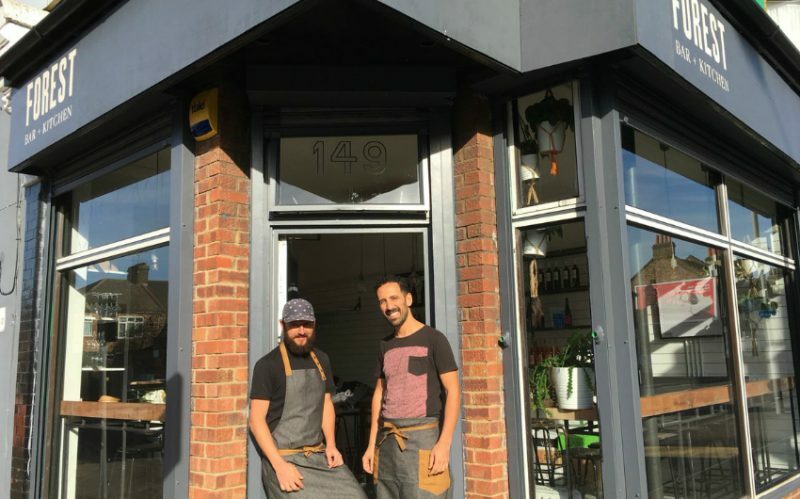 The food menu which is put together with ingredients from the deli also available to take home and sourced from the best local suppliers – Cobble Lane and Dusty Knuckle to name just a couple. The creamy goose rillette, sobrasada with honey on toast and fresh burrata ravioli are all winners and there’s a build-your-own cheese board from the fridge – essential wine snacks. It’s a bit DIY inside but it works and feels a bit Parisian hipster, plus it’s cheap and you can stock up on your refills of the essentials during your dinner – milk, pasta sauces, juices the LOT. During the day St Paul a great place to sit and have a coffee or lunch from the menu of sandwiches, eggs, toasties, and pastries but at night it turns into a proper wine bar. 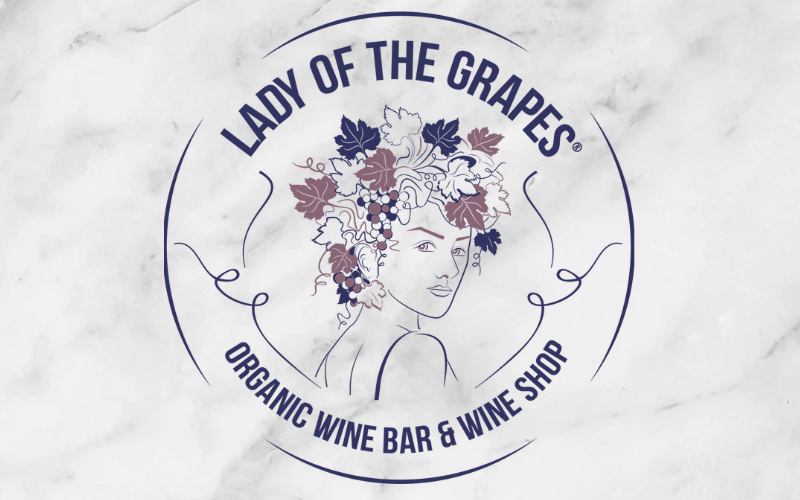 The owners are very friendly and welcoming and talk you through the wines and food with great enthusiasm – this is something they are clearly very passionate about so it’s easy to spend a few hours trying different wines and grazing on small plates of charcuterie and cheese. 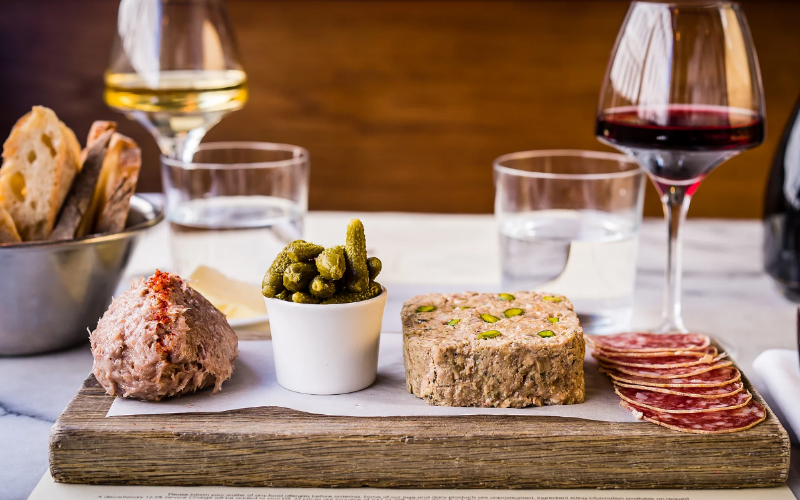 The selection of salamis served with cornichons and chutney, and the creamy rabbit rillettes are great, and don’t miss the epic whole baked Camembert or the ‘nduja on toast. No round up of London’s best wine bars would be complete without Gordon’s. Established in 1890, it’s the oldest wine bar in London, and stepping inside is like going back in time. 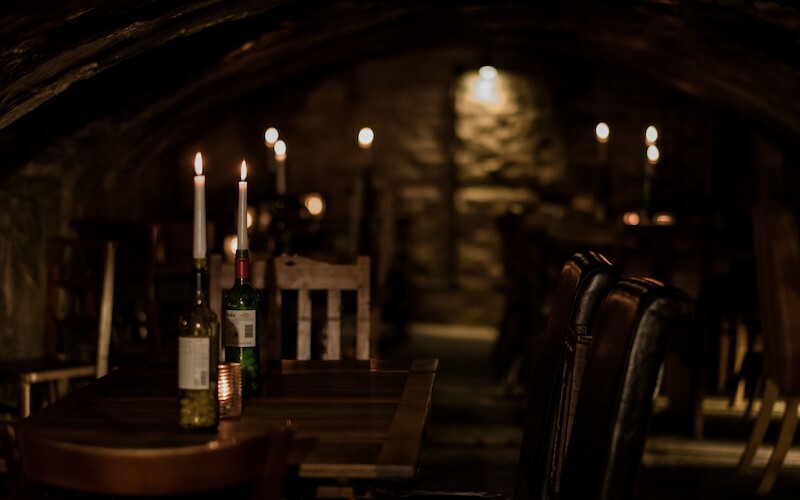 There’s candlelit caves, aged wooden walls, and of course a fantastic selection of wines, sherry, port and Madeira. They have an epic selection of cheeses, as well as a few other snacks like pork pies and Scoth eggs too. 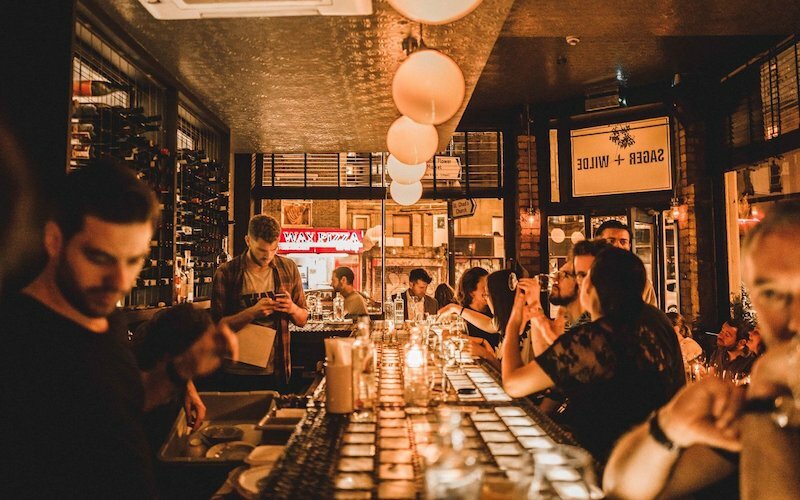 In the summer, they have a long row of tables set up outside, making it one of the summer’s best outdoor drinking spots as well as one of London’s best wine bars. A true classic. The original Sager + Wilde wine bar on Hackney Road can be credited with kickstarting a new breed of wine bars across London. It’s still one of London’s best, dark and cosy with a great selection of wines by the glass at non-ridiculous markups. 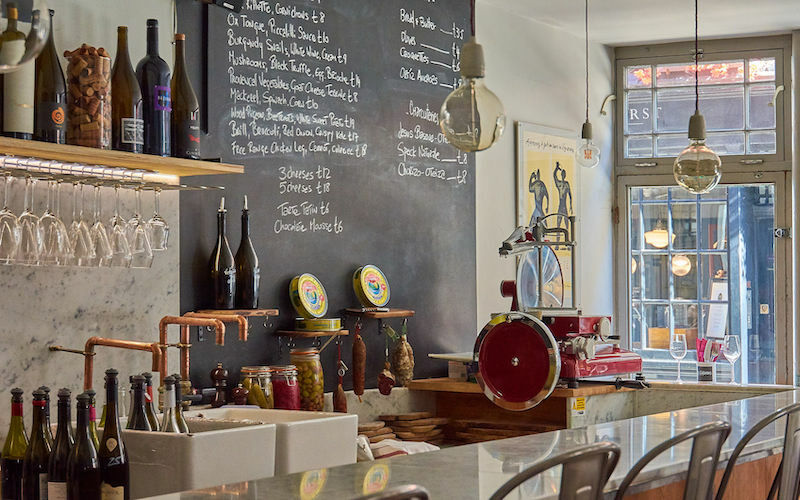 As well as being a great place to discover and drink new wines, they also knock out one of London’s best cheese toasties, plus charcuterie and other nibbles. One of our all time faves. 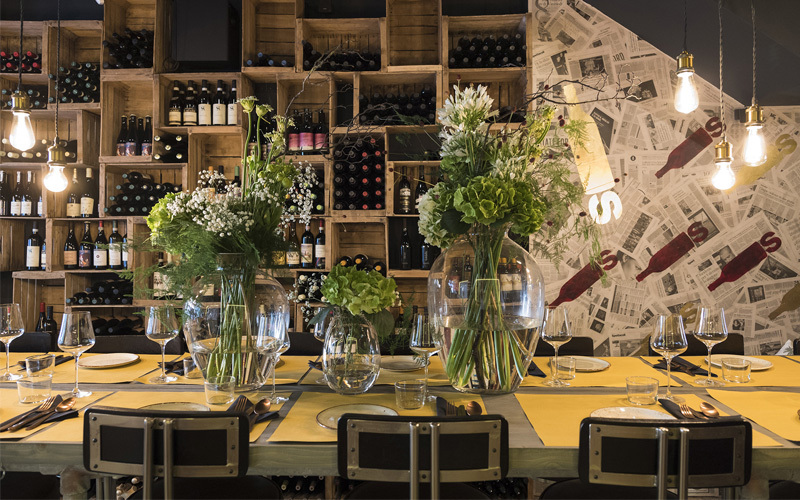 Bottles is an Italian wine bar from the co-founders of Bottles & Battles in Mercato Metropolitano. Teaming up with SOOD Family, who look after the kitchen, Bottles is where your relationship with wine is taken up a notch or two. It’s a beautiful spot, with exposed bricks, vintage fruit crates, distressed leather stools and a gold and blue theme. The wine list, as you’d imagine is extensive, but you’ll be in good hands as every member of the Bottles team is a sommelier in their own right. From sparkling rose, a crisp and sharp Malibran ‘Sottoriva’ Col Fondo Nv Italy Veneto, paired with cacio and pepe rice balls with pecorino and mozzarella to handmade spaghetti all’ amatriciana paired with an Antonio Camillo Morellino Di Scansano, a strong but not heavy red, the wine and food is perfectly matched. Forest Bar + Kitchen is from the people behind Forest Wines, also on Forest Road, which has been selling organic wines to the good people of E17 for a few years now. 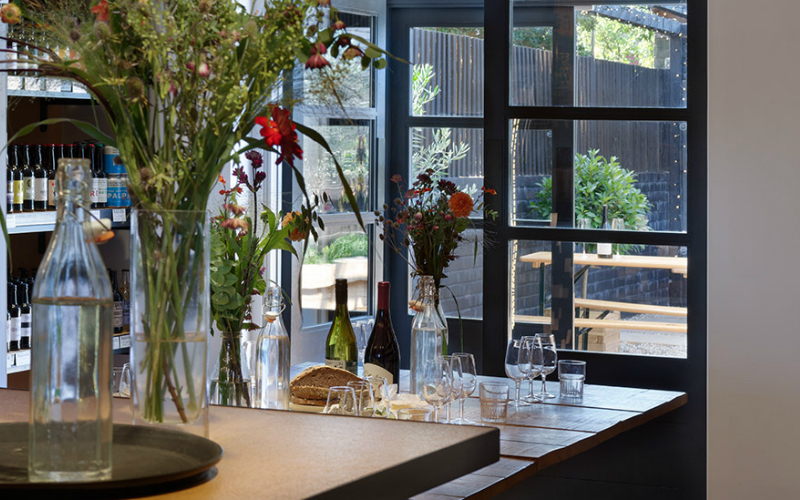 And now Forest Bar + Kitchen is giving locals a place to come and drink and eat around a big communal table with a short menu and, of course, lots of organic and biodynamic wines from small producers. The food menu changes every week, but it could include the likes of a cheddar and kimchi toastie; mussels, ‘nduja and fried bread; braised pork belly with cannellini bean mash; and dark chocolate mousse with salted caramel brittle. Run by couple Eliza and Dan, Yardarm is a wine shop that stocks wines (duh!) spirits, beer, coffee and deli food, and all the produce stocked inside is stuff that the pair genuinely like, with a focus on independent producers and low intervention wines. 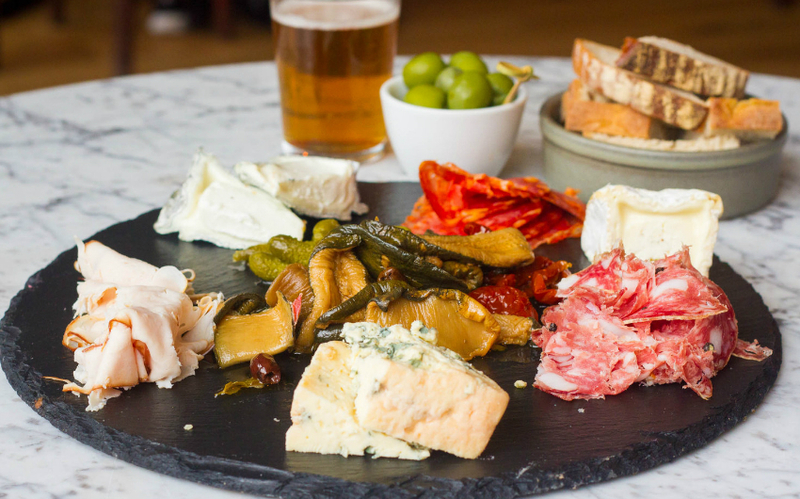 There’s a sharing table in the back where you can get involved in tastings or just pop in for a glass of wine and a cheese board at the bar. It’s a real local gem. Owned by Gergovie Wines, 40 Maltby Street stocks a range of low-intervention wines, mainly from France, Italy and Slovenia, which you can buy to take home or to drink in. 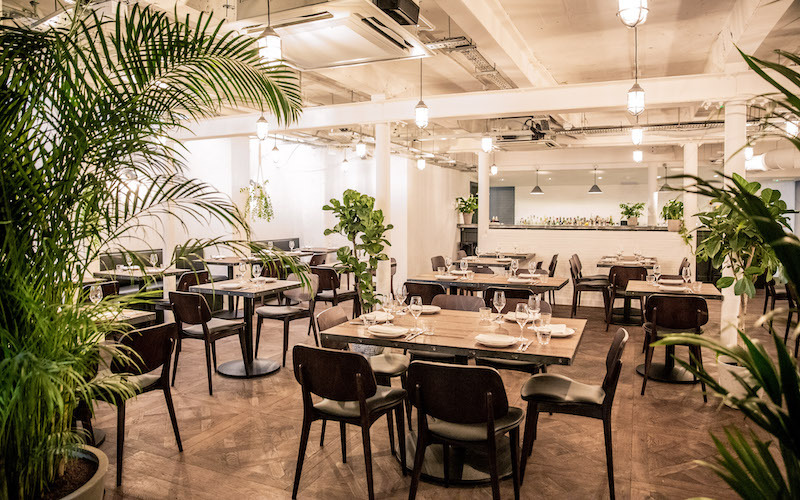 And you’ll want to drink in because the kitchen at 40 Maltby Street turns out some great grub, with the same ethos that’s applied to the wine. The European-influenced menu changes regularly with dishes like salsify fritters with aioli, pork terrine with pickled prunes and plaice with carrots and crab butter sauce appearing in the past.